Yesterday, I spoke to a small group of people at Google. By coincidence, the presentation was held in the same building I used to work in, and a wave of nostalgia swept over me. Participating in Google’s speaker series brought back memories of when I was in the audience seven or eight years ago. I’ll never forget the first time I met Paul Graham in that very same room right after the first Startup School. Nor the crash-course on negotiation I took when we were negotiating with Facebook and MySpace. Nor the management class on having difficult conversations with colleagues, among countless others. Returning to Google reminded me that great companies constantly invest in their people, helping them to understand the world inside the company and outside the company. Coincidentally, in this week’s New York Times, Brian Chen writes about the Apple’s University which teaches Apple employees about typical topics like company’s history and structure, but also delves into much more strategic concepts like effective communication and Apple’s unique design processes. So serious is Apple about their University that Jobs hired the dean from Yale’s School of Management to oversee the initiative. Chen writes about Pablo Picasso’s influence on the school. 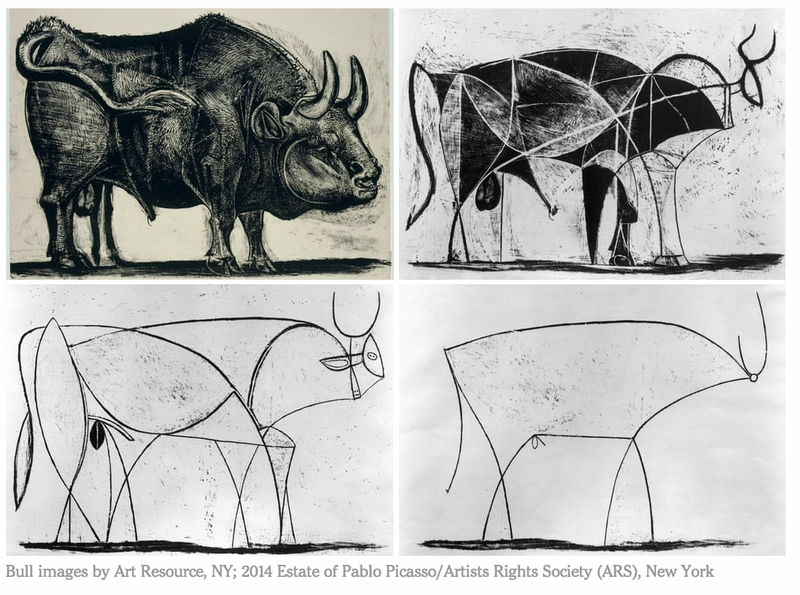 The photo above depicts Picasso’s progressive reduction when drawing a bull, starting from an intricate and muscular animal to a sketch of only seven lines. It’s one of many tools used to teach Apple’s design ethos. As Chen points out, Picasso’s progression is echoed in the evolution of Apple’s mouse, which started as a ten-sided brick with a button, today is a single piece of curved plastic. Apple University is a competitive advantage. Apple commands 6x the operating margin of its competitors because of its design and marketing prowess. After leaving Google, I discovered startups are more open and collaborative with their learning than most large companies. At conferences, events and coffee meetings, startup founders and employees freely share many of the insights into product design, marketing, customer success, and engineering best practices. One could argue the entire open-source movement is a giant continuing education program for software engineers. This fast-paced knowledge sharing is a key part of what makes Silicon Valley such a hotbed of innovation. It’s wonderful that massively profitable, public companies can make these investments. But, how should founders incorporate these ideas into their startups? Most early stage startups can’t afford the expense in time or capital to create education programs. But they can fund continuing employee education on a smaller scale the form of sales training, marketing workshops, guest speakers, management coaching. In the current recruiting environment, I expect this type of perk is be a strong selling point to prospective employees and a powerful retention tool. I think most people who have been through similar program will attest, it’s an amazing feeling when your company and manager invests in your personal success in this way. The loyalty engendered is hard to overstate. As a startup grows and scales, it’s easy to forget about deepening employee education. But the enrichment both in knowledge and network building is invaluable. Furthermore, it’s a terrific investment in the business’ competitive advantage, its people. NB: To see some of the Google public talks, you can visit the Google Tech Talks YouTube channel.